I’ve just updated and refreshed the notebooking tab on my website. I’ve added more information, especially for high school students about using notebooking as a way of homeschool learning. I extensively used the notebooking method alongside Tapestry of Grace and our Charlotte Mason style of learning. I found it to be a perfect way to connect the learning that was going on with a method of narration that allowed for a variety of styles. I know many of you have been reading my blog for years and were along for the ride as I navigated high school with my children, but there are some new readers that may have missed my notebooking thoughts and blog entries. Take a look at the page from my archives with a fresh new look: Notebooking Pages for Homeschoolers. Don’t miss the link on the above linked page to my additional page of information with loads of example pages: Notebooking for High Schoolers. Click to pin to your Homeschooling Pinterest board. Make sure to pin the Notebooking In Your Homeschool page onto your homeschooling Pinterest board for future reference! Top 5 Reasons to Use Notebooking in High School entry for additional inspiration! Please note this is an affiliate link to a product that I love and have used for years! 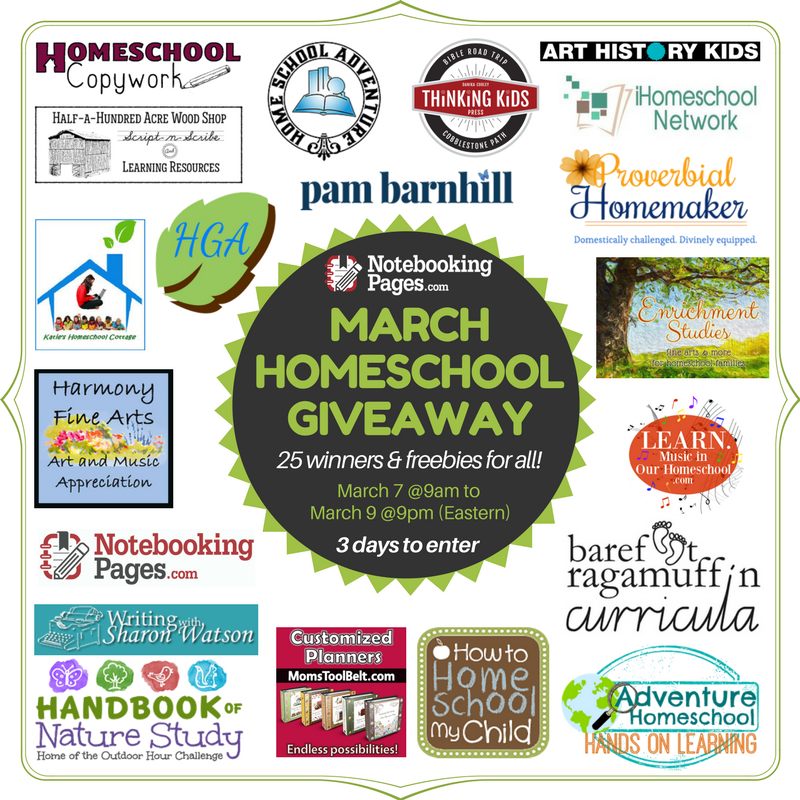 Don’t miss the opportunity to enter the March Homeschool Giveaway over at NotebookingPages.com! There will be 25 winners and 1 Grand Prize winner who will receive over $900 in prizes! Note: I am an affiliate for NotebookingPages.com but as you can read in the entries above…I have used and loved these notebooking pages for many years! You might note that the Grand Prize includes a bundle of Harmony Fine Arts art and music appreciation plans as well as an Ultimate Naturalist Membership over on my Handbook of Nature Study site! Pop over and take a look! I just want all my readers to be aware that NotebookingPages.com’s Fall Lifetime Membership Sale ends today. If you have read my blog for any length of time, you know how highly I valued this huge collection of pages that my boys customized to fit their learning style and interests. I have devoted a whole page here on my website detailing how we used notebooking pages in our homeschool. I would love for you to pop over and take a look for some inspiration: Notebooking. All Notebooking Pages LIFETIME Memberships will be $25 off. Please note I am an affiliate for NotebookingPages.com and will receive a commission if you purchase something after clicking on of my links. Thanks!! !